Have I mentioned I grew up in Brothertown? Less than a quarter mile from where I grew up. Due to a very happy arrival in our family, Brian and I were legally required to cool our heels at my parents’ house in southern Oneida County in central New York, where I grew up. Our enforced (albeit highly enjoyable) 3-day visit reminded me that the little valley where I spent my childhood was the site of an interesting episode in the history of the early republic. Beginning in the 1780s, the upper valley of Oriskany Creek was the location of the first Brothertown. Brothertown took its name from the Brothertown Indians, a nation put together by Samson Occom in 1785 from the surviving members of several New England and Long Island tribes, including the Mohegan, the Pequot, the Narragansett, the Montauk, the Niantic, and the Tunxis. The Brothertowns were widely noted at the time, because they had been American allies in the Revolution (up to and including serving in the Continental Army), were Christians, and were led by one of the most famous Indians of the day. Samson Occom, a Mohegan from Connecticut, rose to prominence in the 1740s and 1750s as a Presbyterian minister and skilled evangelist during the Great Awakening. 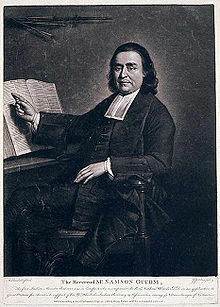 His most famous hour came when Eleazer Wheelock, another Connecticut minister, persuaded him to travel to Britain to raise money for Moor’s Charity School, established for Indian education in Connecticut. Occom’s trip, from 1766 to 1767, was highly successful, but upon his return, Wheelock used the funds to establish Dartmouth College, for the education of English-descended colonists in New Hampshire, instead. After Wheelock’s betrayal, Occom turned his attention to organizing his fellow dispossessed southern New England Indians, a project that would lead directly to Brothertown. 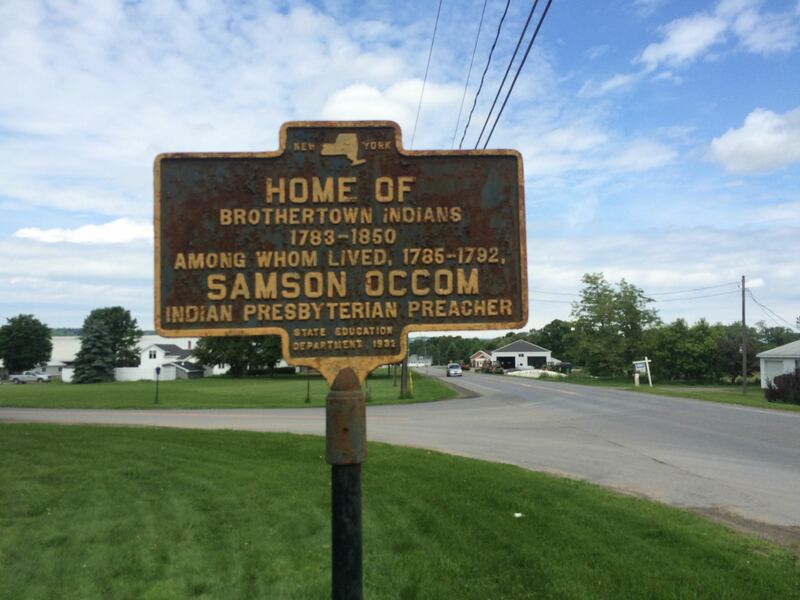 In the later 1780s, Occom led the Brothertowns, along with a few other remnant groups from New England and New Jersey, to create a new settlement in New York on land donated by the Oneida Indians, another American ally from the Revolution. As a result of their support for the Continental cause, the Oneidas were briefly able to hang on to control of their land, and they set aside a portion of the upper Oriskany valley for the Brothertowns’ use. Occom was well educated in both Anglo-American legal systems and Anglo-American duplicate, so he carefully safeguarded the Brothertown settlement with New York civil charters and scrupulously evicted white settlers on Brothertown land. He was successful at defending his experiment in Indian autonomy throughout his life; he died in 1792 and was buried in Brothertown. Later generations were less able to defend their independence in New York, as white settlement pushed ever harder around their fertile valley and as their important and powerful ally the Oneidas were themselves marginalized by hungry settlers. In the 1820s, the federal government began negotiating a series of land deals to get the Brothertowns to remove to Wisconsin, and by the early 1830s, the Brothertowns had sold their land in New York to white settlers and undertaken the long journey through the Great Lakes to Calumet County, Wisconsin, where they named their new settlement Brothertown. Although the Brothertowns are very much alive and active in Wisconsin today, little remains of the first Brothertown in New York. There are a few New England-style houses that date to the late eighteenth or early nineteenth centuries, which most likely were built by Brothertown migrants. There is a Brothertown Road. There is the historic marker pictured above, five doors down from the house I grew up in. And in an overgrown cemetery on a steep hillside, the weathered marker of Samson Occom’s grave. Very nice article. I was raised on Brothertown Rd, deansboro. 1956 – 1975. 2 farms up from route 315. The best place to grow up. Everyone knew each other – like Mayberry! I enjoy the stories of Deansville.